With our rich industry experience, we are engaged in offering Dehydrated Ginger Powder to our valuable clients. Our offered product is processed from premium grade ginger at par with international standards. In order to ensure quality, this powder is stringently tested on various predefined quality parameters. We offer this powder in various packaging options for delivery within assured schedules of delivery. - Dried Ginger powder is an effective cure for indigestion, sore throat, cold and cough. - It is used to treat nausea. - Ginger's therapeutic properties help stimulate blood circulation, cleanse the bowels and kidneys, remove toxins from the body and nourish the skin. - It is used in the treatment of asthma and other respiratory problems. - Dried ginger powder is used in making spices and masalas which are used in gravies, curries, marinades, stews etc. - Dried ginger powder is combined along with cardamom, cinnamon, fennel and cloves to make masala tea powder which is used in brewed teas. - It is used in Indian, specifically Punjabi marinades for Tandoori starters, veg as well as non veg. - It is commonly used to flavour gingerbreads. 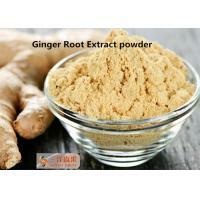 - Dried ginger powder is used in tea or coffee and also in siddha medicine. Dried ginger is nothing but fresh ginger which undergoes a drying process before being used. The fresh rhizomes are soaked in water overnight after which the outer peel is carefully removed using a knife or a peeler. They are washed again and then sun dried on mats or barbecues for around a week. During this period, they are turned periodically. The end result is a pale white dried ginger. Many a times, dried ginger is bleached with calcium carbonate to get a whitish covering on ginger. However, this is not required and can be avoided. This ginger is then powdered in a mixer to obtain dried ginger powder. It's a fine off whitish powder which has a strong aroma and slightly pungent flavour. What is water soluble ginger extract? lessen the discomfort from a cold or flu.